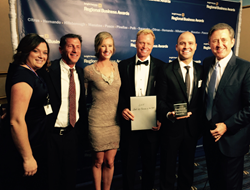 Save On Medical won first place in the start-up category last week at Bright House Network’s Regional Business Awards. Save On Medical is pleased to announce that they have won Start-Up Business of the Year in Bright House Network’s Regional Business Awards. Tampa-based company, Save On Medical, is an online marketplace for medical procedures that uses price transparency to help patients make informed decisions based on cost, quality or convenience- like Expedia does for travel. Save On Medical competed against four other start-up businesses in a Shark-Tank-Style, made for television, Pitch6 event on January 27th in front of four judges; including Shark Tank’s Kevin Harrington. That night Save On Medical won the People’s Choice Award based off of the audience’s votes. The judges then deliberated to select the start-up business of the year announced at last week’s awards. Save On Medical is changing the way patients shop for health care, giving them the power to be consumers in their health care process to save them money while also helping medical providers reach more patients and collect payments online. They are currently working on their first round of funding to develop their mobile app and add surgical procedures and lab services to the e-commerce website. Currently, Save On Medical has pricing and scheduling capabilities for 25% of the country's radiology providers. The start-up would like to thank Bright House Networks, Healthbox, Florida Blue and The Tampa Bay WaVe for all their support. Save On Medical is an e-commerce website that helps patients shop for and compare medical procedures online. Giving patients the power to be consumers in the health care process, Save On Medical is changing the way patients shop for medical procedures. Providers are also able to reach more patients online and collect payment from patients ahead of time. Save On Medical was founded by Chris Christenberry and Matt Schneider in Tampa, Florida and was a Healthbox Florida portfolio company, graduating from the accelerator program in November 2014.